"Come Mangle Some Cans With US!" We are a fledgling new club with a vision of building our hobby and sport here in the South Western Ohio region. We welcome all who are fellow shooters, all who are prospective shooters, and anyone else who just likes to bounce a can around with your air gun! C.M.O. is in process of making plans for a spring Field Target with a "twist." The site and date will be announced with more details soon. The CMO will be having fun matches, that include can rolling, CD Punching and just plain fun. We are centered in South West Ohio. Hopefully our ranks will grow soon. Come out and join us! Contact us at email link below. For more information and inquiries please email us. Click Here To Email C.M.O.! REGISTER WITH IWON AND CAN-MANGLERS OF OHIO WILL RECEIVE $.50 TO HELP THEM RAISE FUNDS FOR THEIR CLUB, IT WILL COST YOU NOTHING AND YOU MAY JUST WIN!! Here's the founding members - Ray, Thom, and Dave. 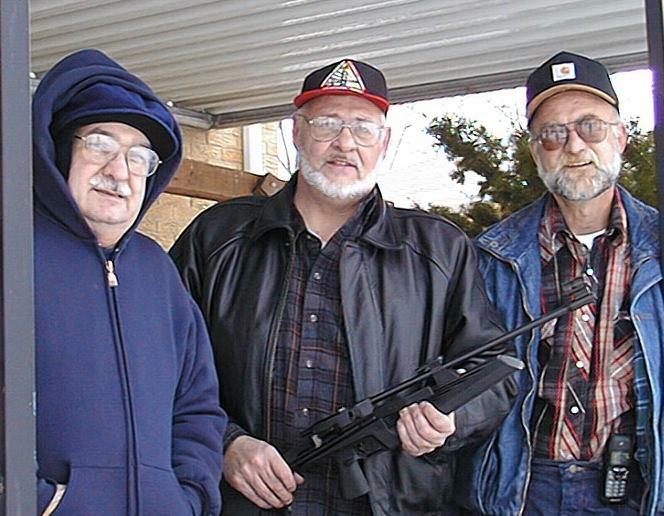 We met over at Dave's house for a "plinking" session. Boy Was It COLD! But we kept the coffee flowing and the pellets flying. Ray is a great shot and has shot in competition with firearms for a number of years. He got bored and took up air guns. We are glad he did. We can learn a lot from him. Well, Dave is in the"crapper". Can you see now why we need to raise some funds? Our out house doesn't even have a back wall on it, LOL. Seriously, this is one of the many fascades set up on the course we will be shooting our FT matches on. It is a great course, that is set up for Cowboy Shoots at Middletown Shooting Club. We plan on having matches in June, August, and October with many practice events set up in between. More to come on the details soon. PLEASE NOTE: Any advertising icons and banners on the body of this site are all means of obtaining revenue for our club. They are not for personal gain of any one member. If you would like to help us raise funds for our club, we ask you to click on any or all of the ad banners on our sites.